Sister Mary Anne (Dorothy) Reed, O.Ss.R., 91, a member of the Redemptoristine Nuns of Beacon, N.Y., died at Lourdes Health Care Center in Wilton, Conn., on October 18, after a brief illness. 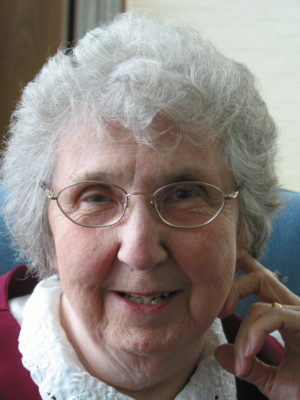 Sister Mary Anne joined the Redemptoristine Nuns in Toronto in 1947 as the first American member and in 1957 was one of six sisters sent to establish the first monastery in the USA at Esopus, N.Y.
Over the years she served the community in various roles as prioress, bursar, organist, and master tailor. Born in Warren, Mich., Sister Mary Anne was preceded in death by her parents, Josephine and Sheldon Reed, and siblings Ray (Norma) Dimick, Rita (Ed) Schroeder, and Shirley (Jim) Moran. She is survived by her sister, Carole (Ron) Mitchell, and many loving nieces and nephews. Sister Mary Anne was buried at the Redemptorist Cemetery located on the property of The Mount Community in Esopus. In reflecting on my call to be a Redemptoristine and God’s gift to me of more than 65 years of perseverance, I am convinced of his special undeserved care and love for each of us—and by the way, that is our Redemptoristine call: to become, for the world, a living memorial of God’s love for each of us. It is the work of a lifetime. We usually do not understand all of the signposts God puts along our way. He asks our trust in his love and guidance. For me, the Shrine of Ste. Anne de Beaupre in Quebec, its atmosphere and the people I met there, were such signposts, and though some things seemed impossible or made little sense for me at the time, a young American still wet behind the ears, I listened and I trusted. I have had the privilege of seeing many changes in the Church and in our contemplative religious life. It hasn’t always been easy, but it has always been enriching. Perhaps my one claim to fame is to have become our best (and only) organist. The celebration of the liturgy and the daily offices has always been important, so the talents I have been asked to develop were a special grace.